What are the options at Austin Street? 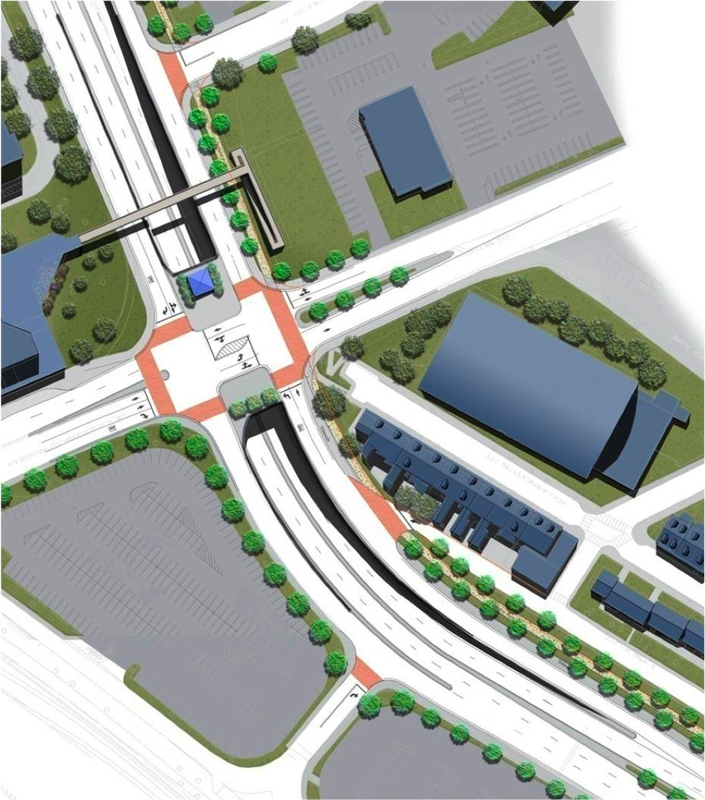 In the Surface Option (2013), the existing underpasses will be filled in and two travel lanes plus a left turn lane will carry traffic between the downtown and Everett. Dedicated right turn and left turn lanes will carry traffic to and from Cambridge via the Gilmore Bridge. All space not used for moving traffic will be given back to the neighborhood to be used for park space, a shared use path, a sidewalk, and on street parking. All told, 50 feet or more of space along the length of the street will become available for the neighborhood to plan. In the Underpass Option (2013), underpasses will be rebuilt but will be four lanes wide instead of the existing six lanes. Traffic traveling to the neighborhood and onto the Gilmore Bridge will be accommodated at the surface through various left, right, and through lanes. A new 1,000 foot long, up to 22+ foot high retaining wall will be built for the new underpass lanes. A total of 22 feet of space will be available for planning, as a result, no surface parking will be added at the Austin Street intersection. Even though both options can accommodate future traffic demand, they offer different benefits to the neighborhood. In 2016-17. BTD introduced new Surface and Underpass Options. See "What will the latest plans look like?" for a comparison between the 2013 and 2016-17 alternatives. 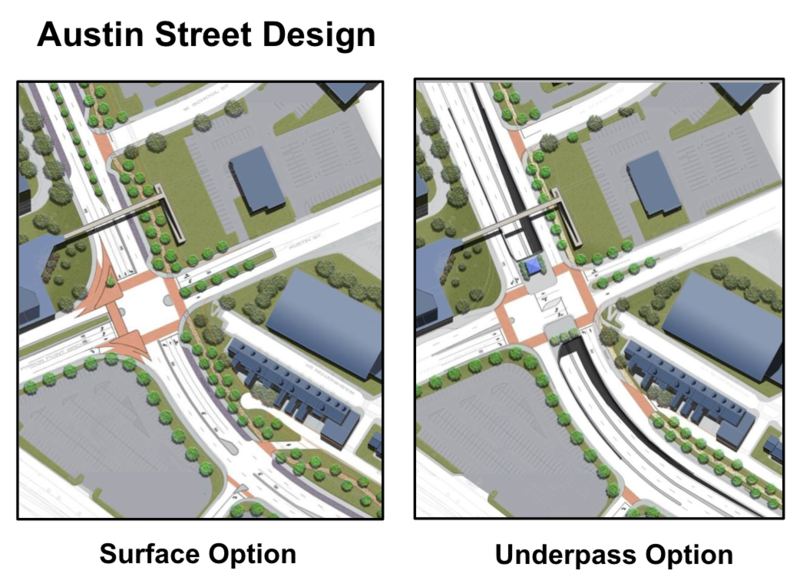 The Surface Option and the Underpass Option are two alternatives under consideration at Austin Street. Each design has advantages over the current Austin Street and Rutherford Intersection. Below we provide a detailed description of each option with advantages and disadvantages. Two lanes inbound to downtown and outbound toward Everett and Somerville. Left turn only lanes onto Gilmore Br and to Austin St. Surface parking on neighborhood side for length of street. 50+ foot separation between moving traffic and neighborhood. Improved pedestrian/bike access to BHCC lots and candy cane path from path on neighborhood side. No opportunity to block intersection – vehicles must clear during each light change. Right turn “slip lane” from Rutherford Ave southbound; space for double right (as exists today). Right turn “slip lane” onto Rutherford Ave southbound toward the Tobin Bridge. Double left from Gilmore Bridge onto Rutherford Ave northbound. Neighborhood traffic has separate through-lane from Gilmore Bridge directly onto Austin St. 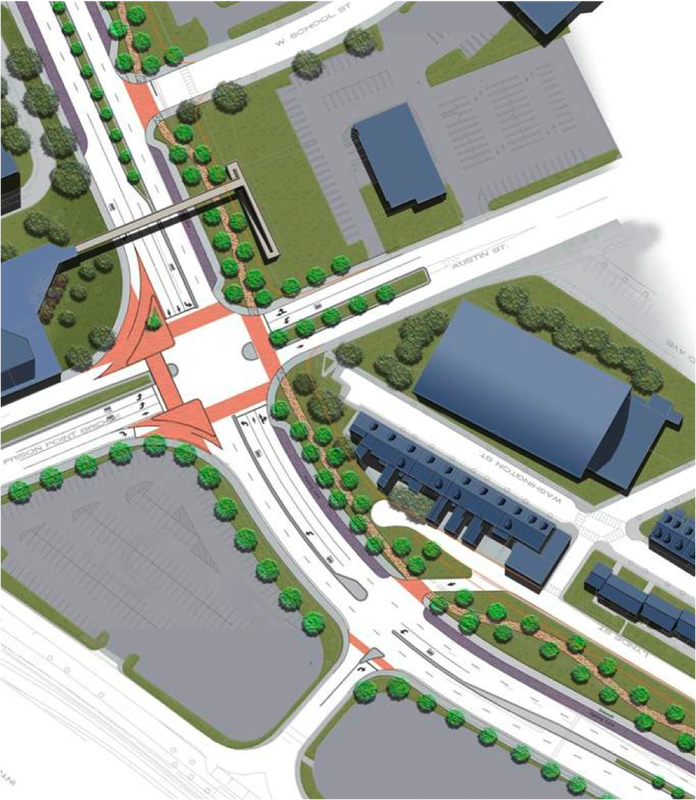 This image is the 2017 version of the Underpass Option which has been colored to show the open space to be added. Although a shared use path has been added along the length of the road in this area. However, since BTD is proposing to only eliminate one northbound lane, there is no opportunity for any green space until north of West School Street. The shared use path will be adjacent to moving traffic with no surface parking to serve as a buffer. It actually appears that some of the scrub trees that have grown up next to Lynde Street will be removed for the shared use path, actually reducing whatever buffer exists today. Four lanes in each direction (2 underpass, 2 above). Left turn only lane from Rutherford onto Gilmore Bridge. Shared left turn-through lane from Rutherford Ave southbound to Austin St.
22 foot separation between traffic and neighborhood. Two 1,000 ft new retaining walls to be built, ~22 ft high. Cannot cross Rutherford to BHCC lots due to ramps down to tunnels, permanently impedes access by foot. Center area of intersection can be blocked by left turn and through traffic (as exists today). Single 90 degree right turn from Rutherford Ave southbound (less than today). Single 90 degree right onto Rutherford Ave southbound toward the Tobin Bridge.